Valve Adapter Gun Haltec 310 / BOWES HT 17-310. 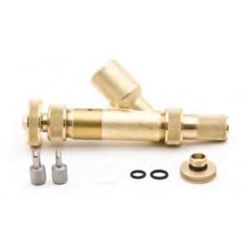 Has a 1/2" female pipe thread and will attach to any calcium tire filling pump, it will extract the valve core from a Standard Bore valve or the core housing from a tractor valve. It will securely hold the valve core or core housing up in the gun body during tire filling or evacuation of liquid from a tire. Due to the design, it will permit faster evacuation of liquid from a tire than with other adapter guns. Replaces Deming #1010.